In our constant quest here at The Welcome Homestead for better quality and cheaper, more sustainable ways of doing things there has been some research done regarding chicken feed. Currently, we feed a complete layer pellet along with scratch grains (corn, barley, wheat, oats) in a basic 50/50 mix. This has worked well for a few years and the birds have been healthy, happy and the egg production has gone well. Last summer we had a high of 22 eggs from 25 hens one day and an average of 17-20 eggs a day for most of the summer. However, feed costs have exceeded the income from selling eggs and this situation had to be stopped. Unsustainable activities will sink the boat eventually if allowed to continue so we have taken some steps to turn things around. Mixing the grains in the same feeder and leaving the feeder on the ground allowed the hens to scratch around in the feeder looking for their favourite goodies and spreading feed over a wide area around the feeder resulting in a huge waste of feed. The feeder was consequently hung from underneath the coop by a hook where it was still sheltered from the elements and only pellets were put into it. This had the dual purpose of getting it up away from their feet so they couldn’t scratch in it and they showed less of a tendency to search through one type of food. 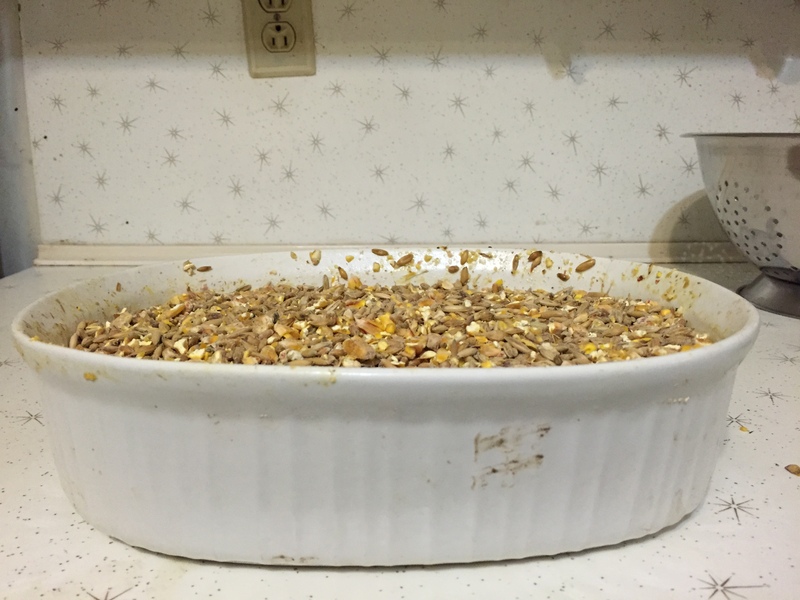 Secondly, we started fermenting the grains by soaking them in water for three days. Fermentation has been used for centuries by people to preserve and enhance feed. Yogurt and sauerkraut are two examples of fermented food that we eat regularly. 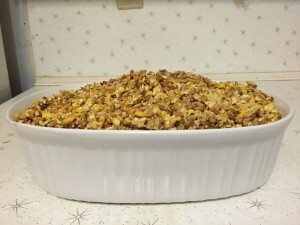 -the fermented grains swelled up resulting in less feed being eaten due to the larger bulk of the grain. 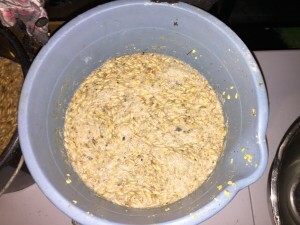 These pictures show the same grains before and after fermenting. -soaking the grain results in more moisture being ingested by the birds reducing the need for water consumption which would help them out on hot, dry days. -the fermenting process increases the acidity of the feed which helps the digestion process and helps the bird’s digestive tract fight off harmful bacteria that can enter through the esophagus. -the fermenting process also results in higher protein, increased vitamins B, C and K and probiotic bacteria needed for better digestion. In this picture you can see the bubbles produced by the bacteria’s digestion process. Overall, we’ve been very happy with the end result. Compared to last summer, our feed costs have gone up about 20% but we have twice as many birds here now. There is a feeding frenzy when the fermented grains are set out and there is usually a small amount of pellets left in the feeder so we feel we’ve figured out the right amount of food to put out for the number of birds we have. In addition, when crops are checked during evening chores they are always full so the birds are evidently getting enough to eat. Their feathers are thick and full, they look and act healthy and the eggs seem thicker and heavier. 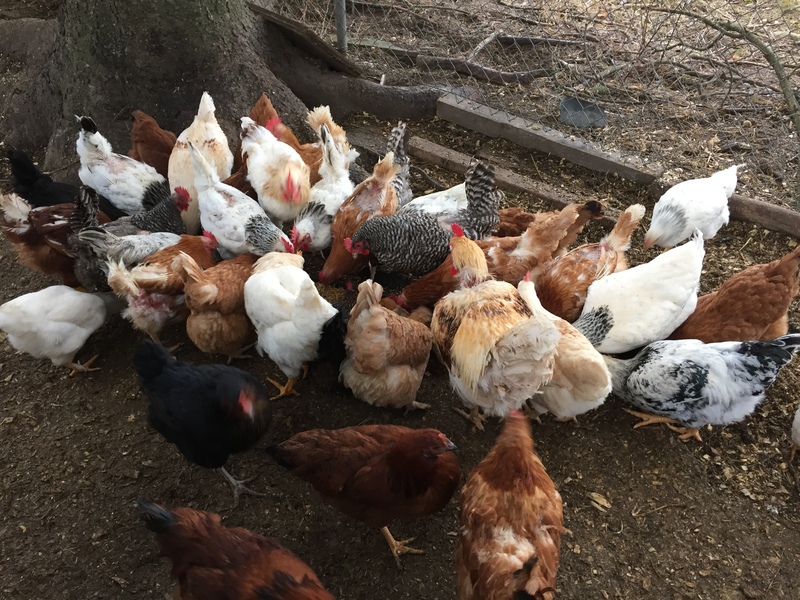 As always, we continue to research and try to find ways to keep everything we do here as healthy and sustainable as possible but we’ve been very satisfied with the changes in the feed program so far and enjoy seeing our eggs and meat come from a happy, healthy and well cared for flock. Last week we separated five roosters from the flock for processing on the weekend. They were young roosters who were hatched last summer and were now mature and causing all kind of chaos in the coop. 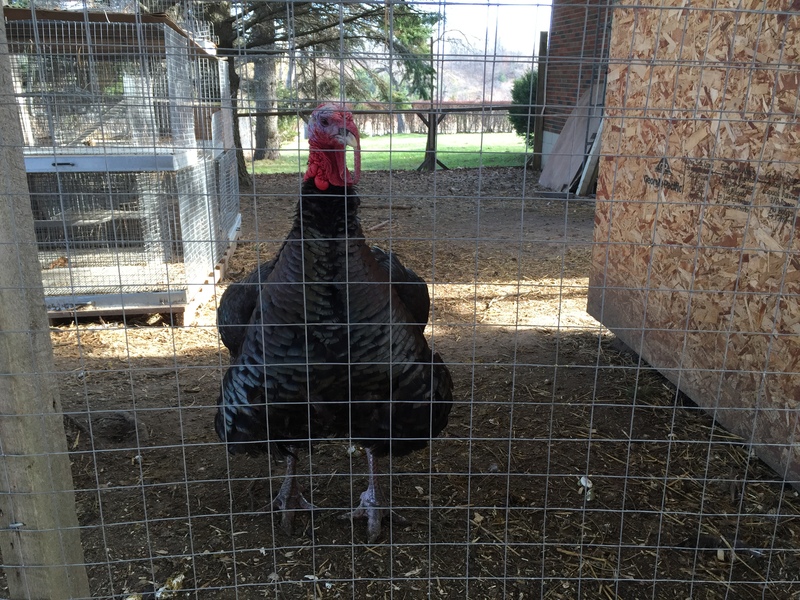 They were put in the turkey shed with the intention of processing them last weekend. Due to having a busy weekend we didn’t get to the processing and plans were made to process them on Monday. At chore time Monday morning we opened the door to the turkey shed and were met with a scene of devastation. Things in the shed were knocked over, there were feathers everywhere and the bodies of the five roosters were scattered around the shed. The bodies were not eaten and, aside from some obvious injuries to the necks that likely caused death, they were largely untouched. We lined the bodies up inside the door to deal with the situation later. It was a real punch in the gut to be greeted by that scene by surprise. When we returned from a couple of hours in town it was discovered that two of the bodies had been moved so they were returned to the rest of them inside the door. A couple of hours later the bodies had been moved again and an attempt had been made to drag one of the birds down the hole that the predator had apparently come in. The bodies were then removed and taken to the compost pile and a live trap was set just outside the hole with a can of sardines and a rooster head in it. 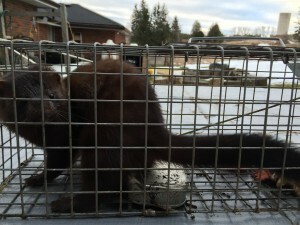 Sure enough, the next morning we had an unlucky occupant in the trap. 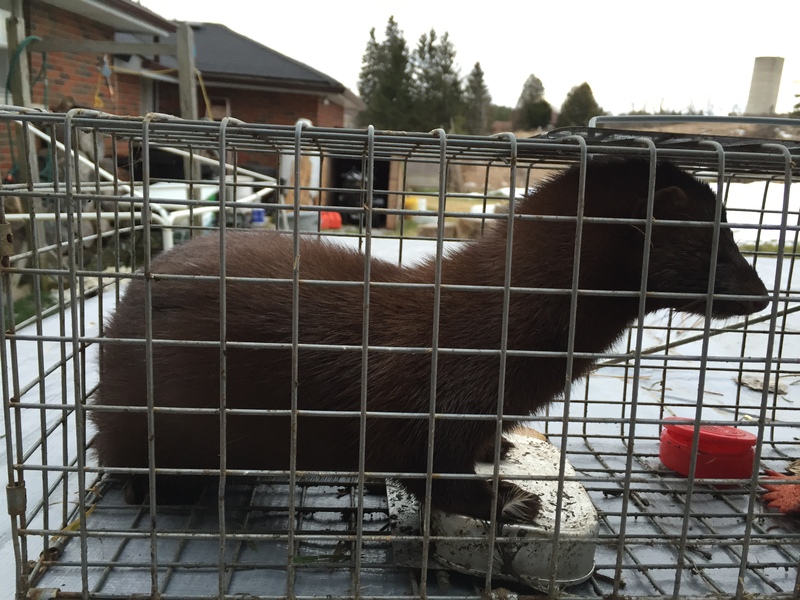 General consensus is that is was a mink. 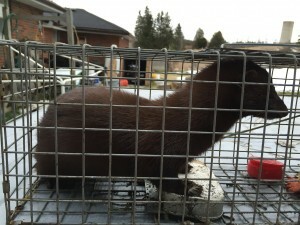 It was very feisty and screamed and hissed in the trap. Fortunately, mink are generally known to be solitary and territorial so there is little chance there is another one around for the moment. It’s possible another one will move into this territory so the traps will continue to be set out just in case. There are already traps out to catch any rats that may be around as we’ve caught about a dozen since early last summer. 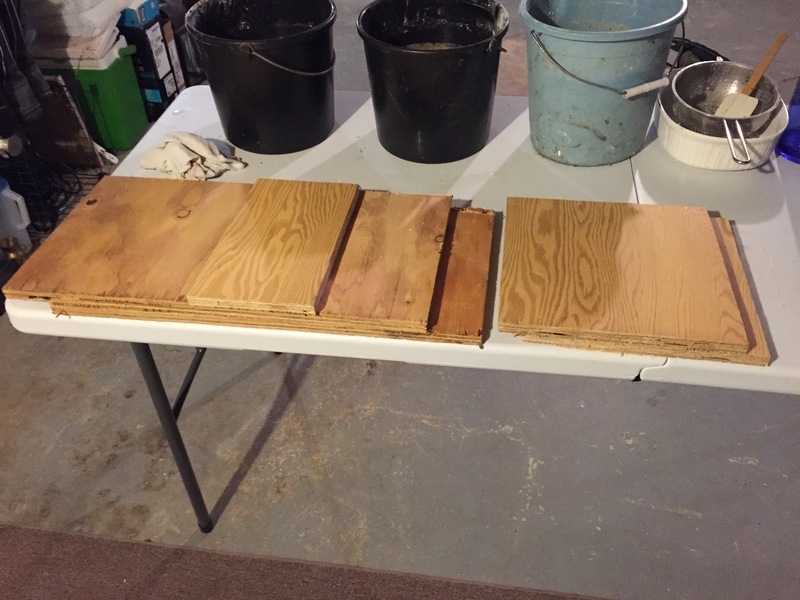 As with everything else here on The Welcome Homestead we try to build everything solid and with good quality material but time and wear and tear still have their effect on everything. 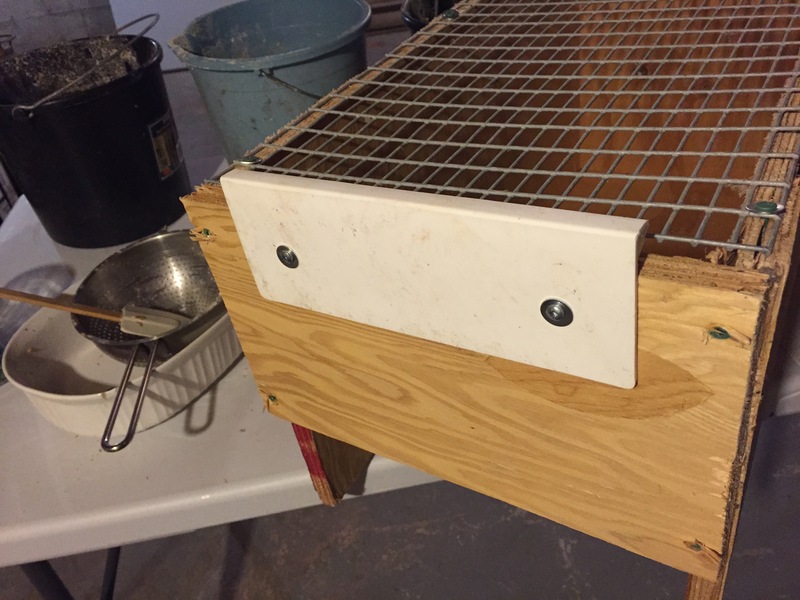 We build the rabbit nest boxes out of ¾” plywood for durability and the thicker wood has a better insulating effect than thinner wood. We build them out of wood to also give the rabbits something to chew on as their teeth never stop growing and they need to constantly wear them down to avoid over growth. It’s also easier to screw thicker wood together without it splitting. Some of our nest boxes have been around since we first got rabbits in the winter of 2008 so some are in need of repair or replacement. We start off with precut sections. 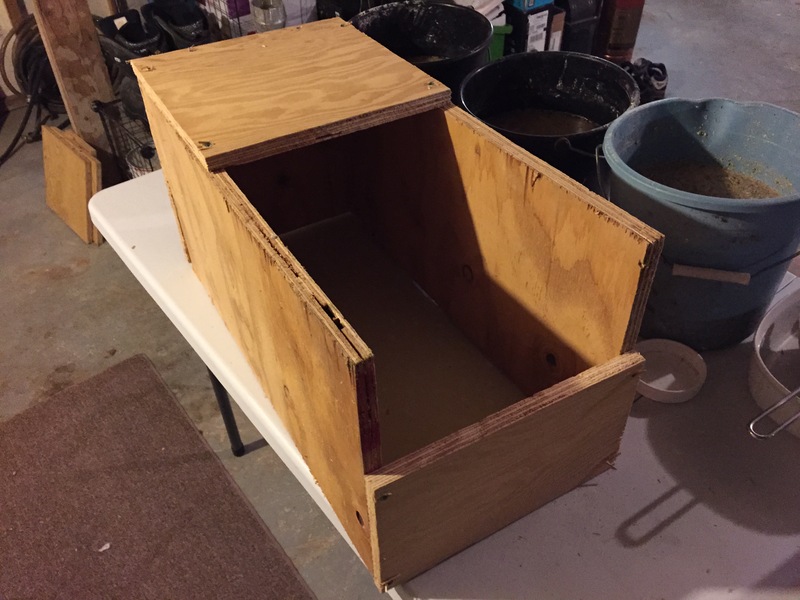 The nest boxes for New Zealand rabbits will be about 12” wide, 12” high and 24” long. This gives the doe room to turn around in there but is still small enough to keep the kits in a confined enough space that they can easily find each other to group together for warmth. 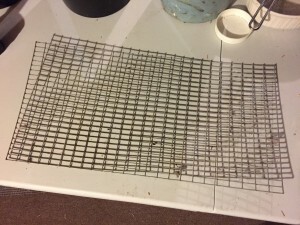 When the box is completed we cut a piece of cage floor wire for the floor. 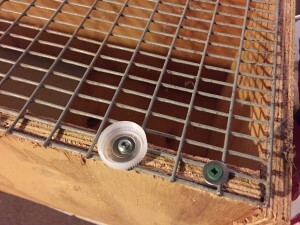 It is ½”x1” 14 gauge galvanized wire which is strong enough to hold the weight of a 10-12 pound doe and her kits and the wire gap is small enough so the kits won’t fall or crawl through. 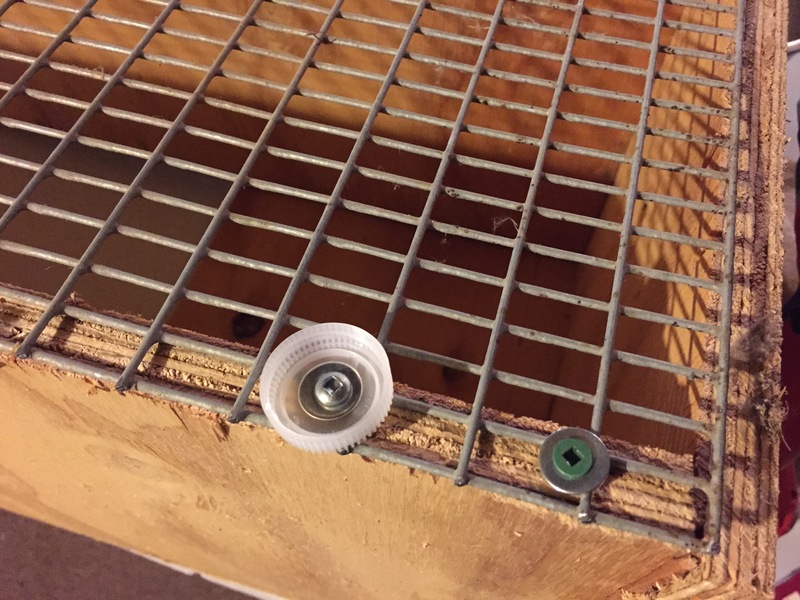 It is screwed to the box with 1 ½” deck screws and washers. This will also let any urine drain out of the bottom of the nest box so the bedding will stay drier. When the floor is fastened to the bottom of the box we need to keep it off the floor so any poop or straw won’t stick to the bottom of the box and any moisture has the ventilation it needs to dissipate. We have no idea what the brackets are from that we used for the front of the box but they are plastic and do the job nicely. On the rear of the box we used the plastic caps from water bottles. After some use we will see if they hold up but they can be replaced with something sturdier in the future if need be. They just happened to be what we had lying around and in the interest of doing things as cheaply as possible they did the trick for now. 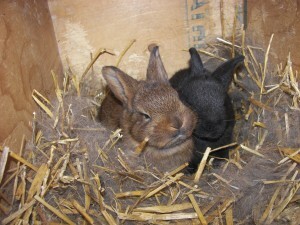 The finished nest boxes were taken out to the colony and stuffed with fresh straw. Now all that needs to be done is the does need to fill them with baby rabbits and all will be well! As the world reeled in shocked horror in the wake of the terrorist attacks in Paris it unleashed the predictable torrent of emotional outburst so familiar after any large world event. Many people changed their Facebook profile to include an overlay of the French flag on their avatar. Monuments around the world were lit up in the French flag colours and another wave of moral outrage against Islam was unleashed on the internet. Once again, though, there will be an effort to fight against the symptoms instead of getting to the root of the problem. Each time a world power gets goaded by a small terrorist group they end up stomping around the world, usually the Middle East, snorting and raging against anyone they think is connected to the attacks. This behavior is very predictable and exactly what the terrorists want as it legitimizes their cause and gives them yet more reason to attack the west. In addition, it continues the financial bleeding that a great many of the western countries cannot afford as they are already swimming in debt that they cannot afford. A small scale guerrilla attack costs comparatively little, perhaps a few lives and whatever it costs to set them up with guns, bomb making materials and the means to get them to the site of the attacks. The Return on Investment is quite substantial, though, as a country that is the site of these attacks usually spends hundreds of billions (trillions?) in the following years in a massive military campaign that may take out a small number of the terrorist organization and cause huge collateral damage in the process, many times wiping out the infrastructure of entire cities leaving the population living in horrific conditions and disillusioning many people making them more likely to join fanatical groups bent on the destruction of the west. This can continue ad nauseum if we let it and in 100 years we will be no farther ahead than we are today, in fact, the multiple tiny bites of terrorism could cause the west to bleed dry and collapse, resulting in the fall of society as we know it today. However, there is a solution but it wouldn’t be very popular with those who profit from war but would likely save millions of lives. Imagine, if you will, that the money that is poured into the military campaigns was instead spent on education and infrastructure, not just in the Middle East but everywhere. Improve our school systems here at home and build schools, libraries, playgrounds and recreation facilities around the world. Build infrastructure in population centers in third world countries such as fresh water systems, sewers, electrical grids and improve food production and distribution systems. If something gets blown up or destroyed, rebuild it as many times as necessary. This money was going to be spent on destructive military campaigns anyway so it’s not being wasted even if something that it was used for is destroyed and needs to be rebuilt again. Even if only half of the money spent on military uses were to be used it would still be hundreds of billions of dollars and that would make a huge difference. If you provide people with a clean healthy environment in which to live and educate them to a level that they can feel empowered and think for themselves they are many times less likely to be disillusioned about their situation and go fight in inhospitable conditions. As more and more people become educated and the standard of living increases it should result in a drop in religious fanaticism which is born out of ignorance and disillusionment. This does not negate the necessity of military action. Walk softly and carry a big stick, as they say. Military action is a necessary tool in the political handbag but must be wielded with care and responsibility and also with the knowledge that it comes with a heavy cost in money, resources and, most importantly, lives. However, if we can start to divert a small part of the military spending toward social and infrastructure improvement I think we will find that, as conditions improve around the world, there will be less likelihood of radicalization happening in the first place which will result in less need of the military machine, thereby reducing the need for military spending and allowing a greater portion of each country’s spending to be directed toward more constructive projects. Saving money by reducing the problem in the first place saves a lot more money than by trying to treat the symptoms afterward. We’ve been enjoying the extraordinarily mild weather here at The Welcome Homestead and appreciating the lack of frozen water bottles and jugs which makes chores a lot easier. 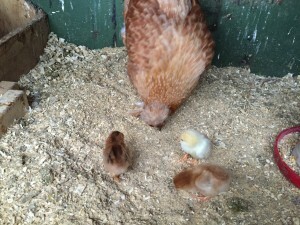 It’s giving the baby chicks a bit more of a running start and the compost piles are still steaming. We are enjoying the green grass but not the flies, which seem to be hanging around longer than normal along with the ladybugs. As we enjoy the warmth we are aware that there may be consequences down the line as farmers depend on a thick layer of snow to insulate the ground and the spring melting of snow to soak the land in preparation of seeding the crops. Deep cold also kills bacteria and viruses so that may also have consequences in the coming year. We have caught three more rats in the last two weeks and the ground under the coop and turkey shed are laced with tunnels. The turkey shed has large mounds of dirt in it being brought up from the tunnelling operation and the amount of dirt piles indicates that the rats must be about halfway to China by now. The dirt piles have come in handy, though, allowing us to fill in some low spots on the ground and level out the floor of the shed so as they say: lemons into lemonade. 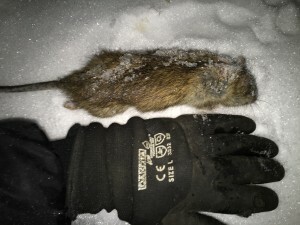 Hopefully we can keep the rat population in check although it would be better to eradicate them completely however they can be a real challenge to get rid of once they’re established. We are now starting to protect the feed better by using plastic totes and may enclose the shelf with the feed bags on it in wire mesh from some of the older cages we have lying around here. The three winter chicks are now two. The smaller yellow one is gone, presumably killed and eaten by the other chickens. It was a bit smaller than the others and looked a bit frail so it might be a case of it simply being the weaker one that didn’t make it. It was fine at chore time Thursday morning but was gone a couple hours later when the water was topped up. 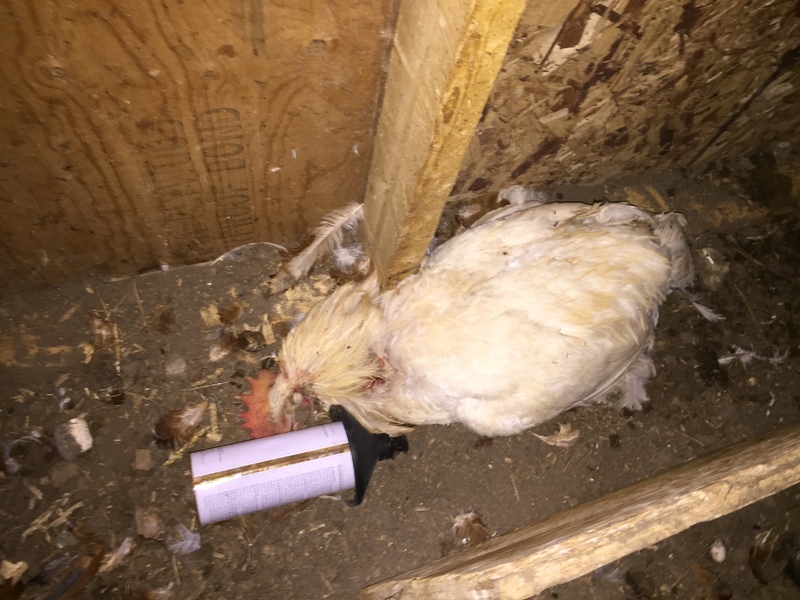 It was seen being stepped on by a rooster and while the rooster was shooed away and the chick seemed fine there may have been an unknown injury to it and it may have died. Mama Hen was doing a fine job being feisty and protecting her little charges but if one got significantly weaker or injured it would have been vulnerable to the other birds. The rest of Thursdays chores were done with a heavy heart as we tend to get attached to the beasties around here and it’s always difficult to see Nature take its course in a very harsh way. We have started feeding the chickens fermented feed, basically soaking scratch grains in water until it starts fermenting. It usually start to show bubbles in the first day and we are feeding it to them on the third day as this has been recommended by several sources as an optimal time in the fermenting process. Fermenting has a few benefits including producing healthy probiotics which are beneficial to the birds digestive system as well as producing some beneficial vitamins and bacteria. 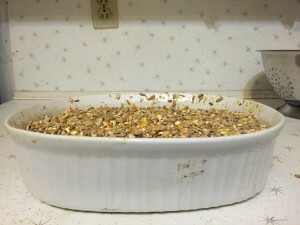 It also serves the purpose of softening the outer shell of the grains making them easier to digest and the grains absorb water which helps to keep them hydrated. This should also result in the birds eating less food due to the higher nutrition and easier digestibility and is also supposed to increase the egg production and size of the eggs and yolks. As we just started there is not much in the way of results yet although they are eating a fair bit less pellets after only a week on this feed plan so it is encouraging from that standpoint. Humans have been eating fermented foods for a long time, such as yogurt and sauerkraut which are known to have high levels of probiotics in them. Fermentation has also been used for centuries for preserving food. We wish everyone a happy and productive week and a safe and very Merry Christmas! It’s been an amazing stretch of weather here on The Welcome Homestead with only a couple of nights in the last week or so dipping down cold enough to freeze the rabbit’s water bottles. Actually, it’s only the ball and tube on the bottles that has frozen, not the entire bottle. Chores are much easier not having to deal with the frozen water and we’re looking forward to this weather lasting as long as possible. Dawn hatched out three chicks from the original ten eggs. 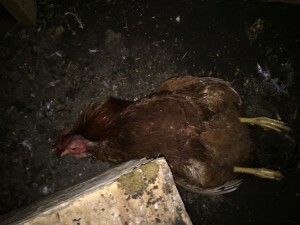 Two mysteriously disappeared during the course of her sitting and two partially hatched but were crushed and died, likely from other hens trying to squeeze in to lay an egg in the nest, despite the fact that there are eight other perfectly good nests basically begging to have eggs deposited in them. Three formed but did not hatch and were laid to rest in Mr. Compost Pile. The three chicks seem to be doing well and are active and learning from Mom how to scratch for food and do chicken stuff. There are two brownish chicks and one yellow one and Momma hen has turned into Momma Bear. She’s aggressively chasing away any other hen who gets too close to the chicks and pecks the crap out of my hand when I reach in to pick the chicks up to check them. She has hatched out two batches of eggs so far this year so her mothering instincts seem to be in full gear. The warmer than usual weather should help her raise the chicks in the coop and they will be starting to grow feathers soon so we’re keeping our fingers crossed. 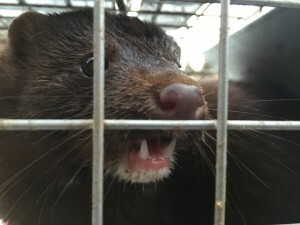 Three more rats were caught this week which makes about eight this year so far. It’s the first year with rats here and we’re hoping we can keep up with the population or even get ahead of it but apparently rats are very difficult to get rid of once they’re established. The ground under the chicken coop and feed shed is laced with tunnels and there is evidence of fresh digging most mornings with a fresh pile of dirt here and there. There also looks like there is a tunnel entrance/exit in the rabbit colony so we’re a little concerned about that. 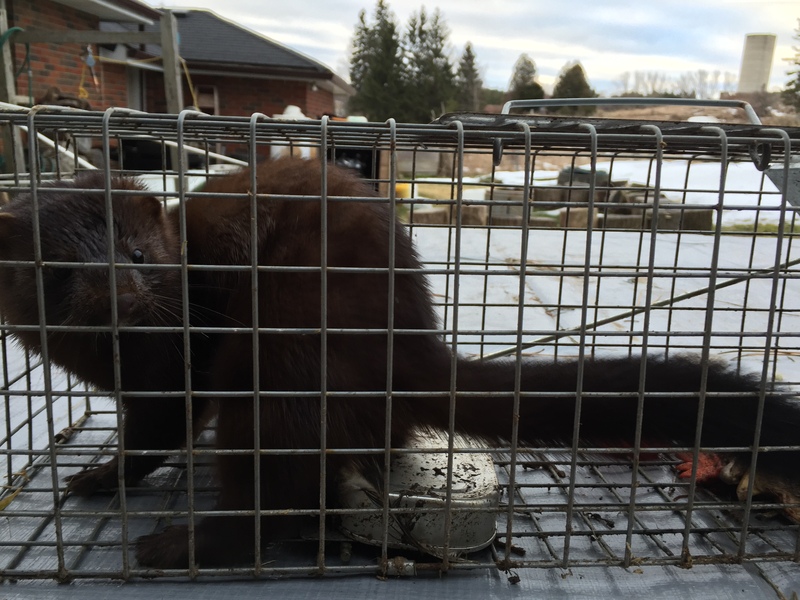 We will continue to put out traps and will buy more if necessary and hopefully we can keep from getting over run. Lucille Bunnyrabbit continues to maintain a lovely deep nest full of fur but no little ones. It’s very disappointing but there are renovations due on the colony so we hope the updated facilities will help her get settled down if we can start working on it now due to the great weather. Future plans may include the purchase of a new doe to introduce some new blood into the mix since we have been “keeping it in the family” since the first rabbits were purchased in Feb. 2008. Fred is the son of Adam, our first buck, so we hope we can continue the lineage down the bucks side of the family and have one of Fred’s sons available for when he reaches The Big Sleep. Once again, we wish everyone a safe and productive week. Here at the Welcome Homestead we have electric baseboard heating. Yup, that’s bad! The only advantage is being able to heat individual rooms on their own but it is still pretty pricey. Being hooked to the grid leaves us dependent on the prices and reliability of others. We have been exploring alternative ways to power and heat the house and it seems that we have to return to older technology in order to control costs and achieve independence. Sure, power generating stations give us reliable power on demand and generally aren’t subject to the whims of nature like solar and wind power generating systems are but at what cost? Nuclear plants have incredibly toxic waste to dispose of, coal and natural gas plants have carbon emissions issues and hydro plants flood vast swaths of land in order to provide enough water to power the turbines. These plants are also very expensive to build and maintain and the transmission network needed to deliver the electricity to the customers is expensive and soaks up power along the way so what you put in to the line at one end isn’t what you get out the other end. As with everything else we consume, this leaves us with three choices: Status quo, change or do without. Since it is difficult to get along without electricity and maintain the lifestyle and technology that we are used to the last option is out. Sure, a lot of us would love to go live in a cabin in the middle of nowhere and enjoy the peace and quiet but we humans are social animals at heart and most of us would at least like to communicate with our friends and loved ones from time to time and that’s a bit difficult without some sort of power. We could go with the status quo, pay what the power companies charge us and have our convenient power any time we need it. If people are happy with that, more power to them (pun intended). It is nice to have the convenience to flip a switch and cook, do laundry or turn up the heat whenever we want. However, for some of us who would like to save a few bucks and perhaps be independent of big business there are a few alternatives we can explore on our quest for peace and self-sufficiency. 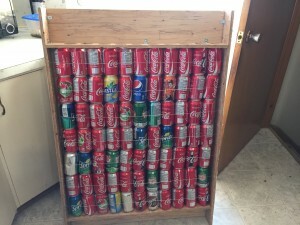 This project is the pop can solar collector. It’s by no means new technology, in fact it’s basic physics that we have known since man (or woman) first stood in the sunshine and felt it’s warmth on his (or her) face. Touch a rock or some pavement that has been in the sun for any period of time and, of course, it’s hot. The sun shines down on our heads for free and we fail to utilize this amazing resource. 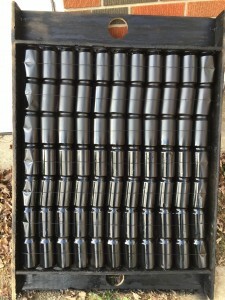 The solar collector is simply a way to gather that heat and distribute it in an orderly manner. 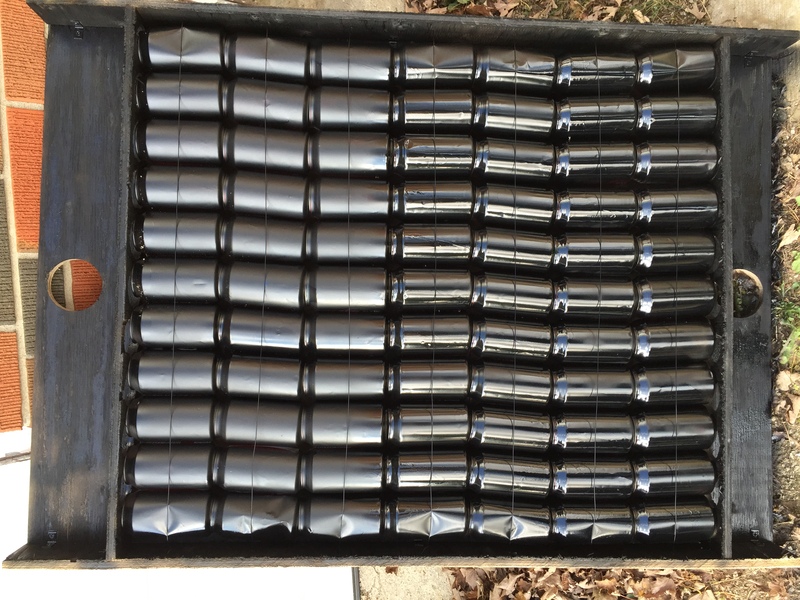 There are companies out there who manufacture solar collectors like this, in fact one buys pop cans from a recycling facility and reuses them in their units. However, we are doing this on the cheap so we are trying use as much scavenged materials as possible. This particular project will be fitted into a window. Others are self-contained units which we will explore at a later date. 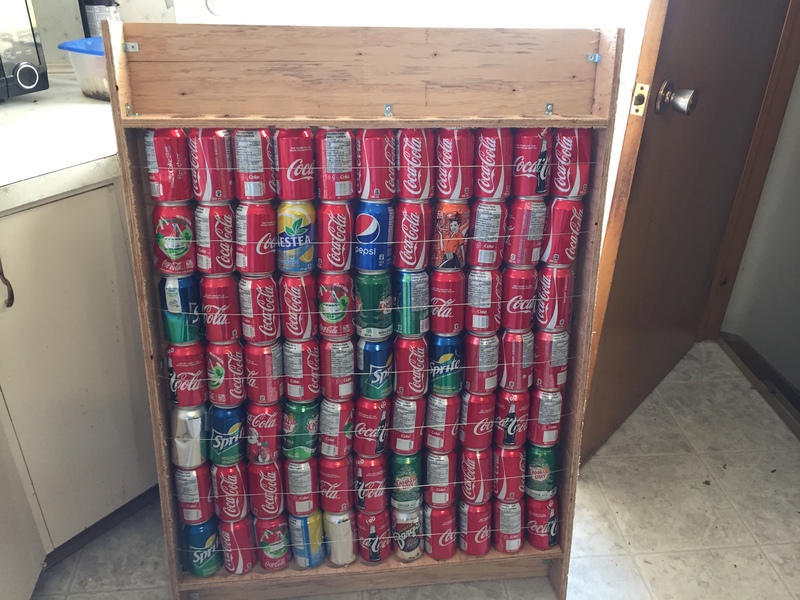 We start by measuring the window that will be the new home of our solar collector then build a box the size of the window and deep enough to accept the width of the pop cans. There is a piece of wood cut to contain the rows of cans on the top and the bottom and holes cut in these pieces to accept the tops of the cans. 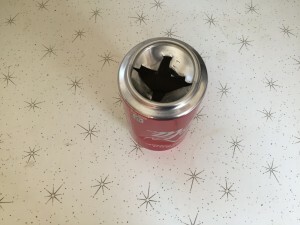 Each can is washed in dish detergent so the paint will stick to the can and a hole is punched I the bottom of the can so air can get through when the cans are placed end to end like tubes. After the cans are placed in the box they are secured with wires and then the entire unit is painted black with high temperature frame and roll bar paint. 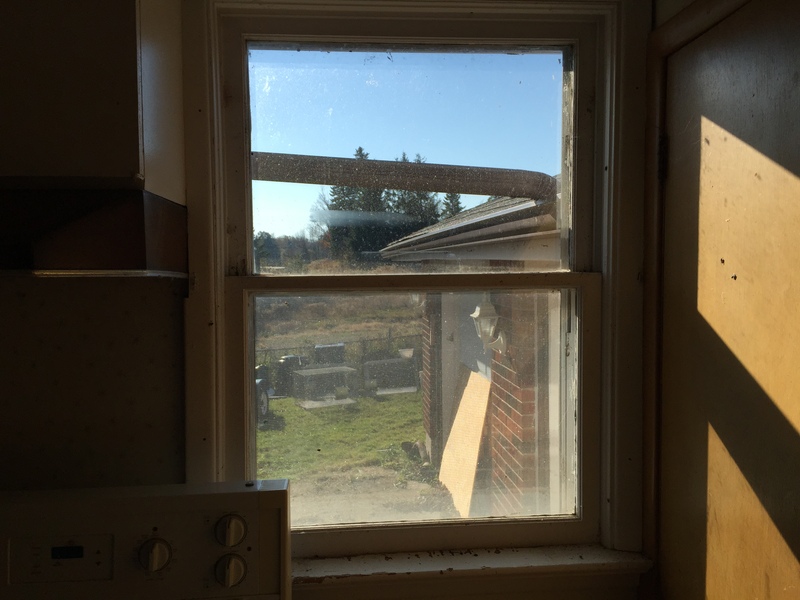 Once the paint is dry the unit is placed in the window, secured and sealed and the fan installed on the bottom. As the sun heats the cans air is blown through the unit, picking up heat and distributing it to the room. 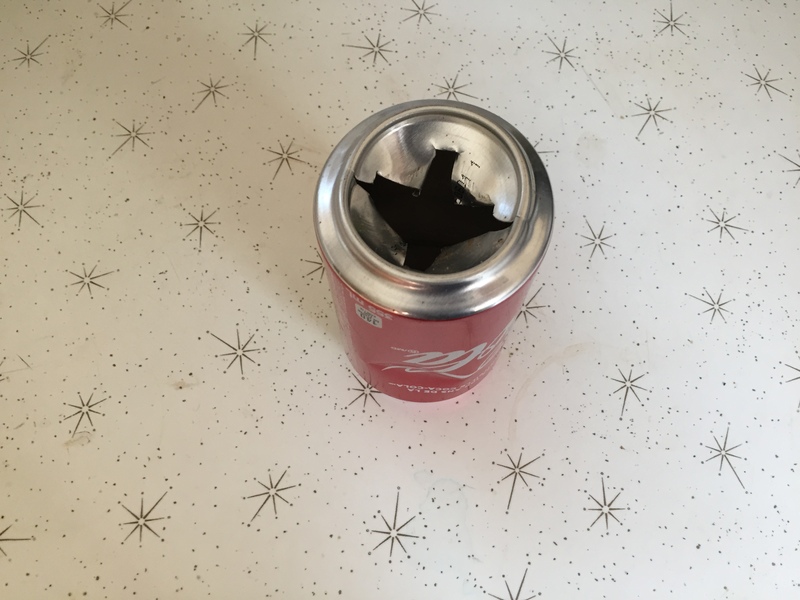 Pop cans are used because of the superior heat transfer qualities of aluminum. This particular project has hardly been professional and still needs some tweaks such as improving the seal on the box but it is operating in principle as expected. It does keep the kitchen a few degrees warmer than it would be without it although we don’t have official temperature stats at this time. The temperature inside the unit gets off the scale of the thermometer which tops out at 120 degrees F. The fan is a bathroom fan which is rated at 70 cfm and draws 100w of power. 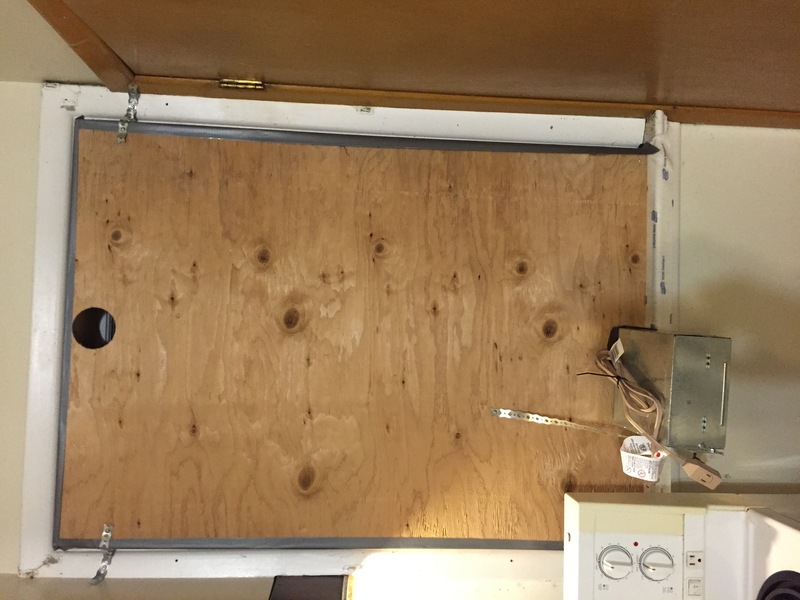 If that fan can prevent the 1500w baseboard heaters from coming on it’s a big savings right there. 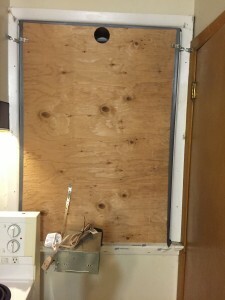 Some improvements would make this unit more efficient, for example, we plan on blocking off the two doorways out of the kitchen to prevent heat from going into other parts of the house which should make the kitchen warmer due to only having to heat a smaller space. Sealing the unit better would make it more efficient and putting a duct from the unit to the center of the room may distribute the heat better. We fully appreciate that it only works in direct sun but anything that can reduce our costs and environmental footprint is a step forward. This idea can also be built to work without a fan, using only the convection of the air inside the unit to power it. As air is heated it rises and exits out the top of the unit and draws cooler air in from the bottom. 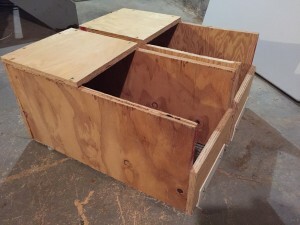 Slits as wide as the unit would have to be cut where the holes top and bottom currently are to make this work. Some in the real estate profession have been using ideas similar to this in unoccupied houses to keep the house temperature above freezing so the pipes don’t burst. 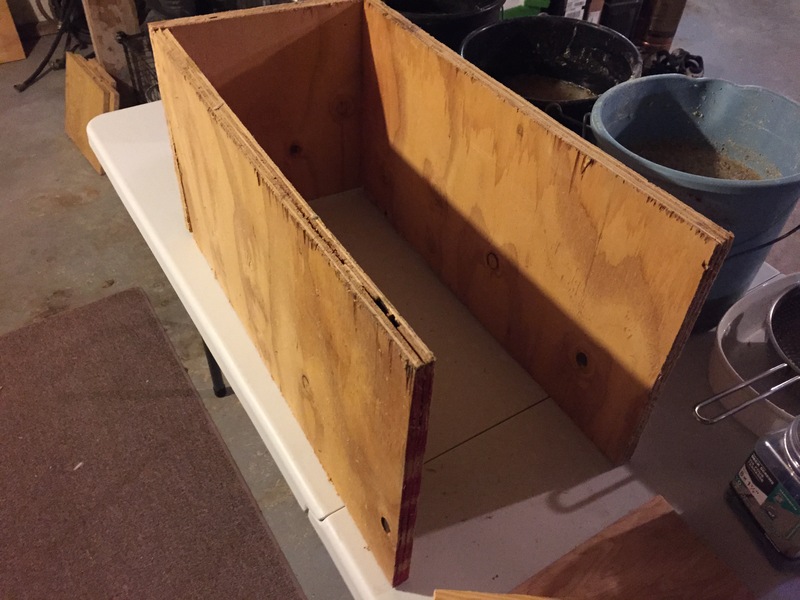 The cost of this project came out to about $70. 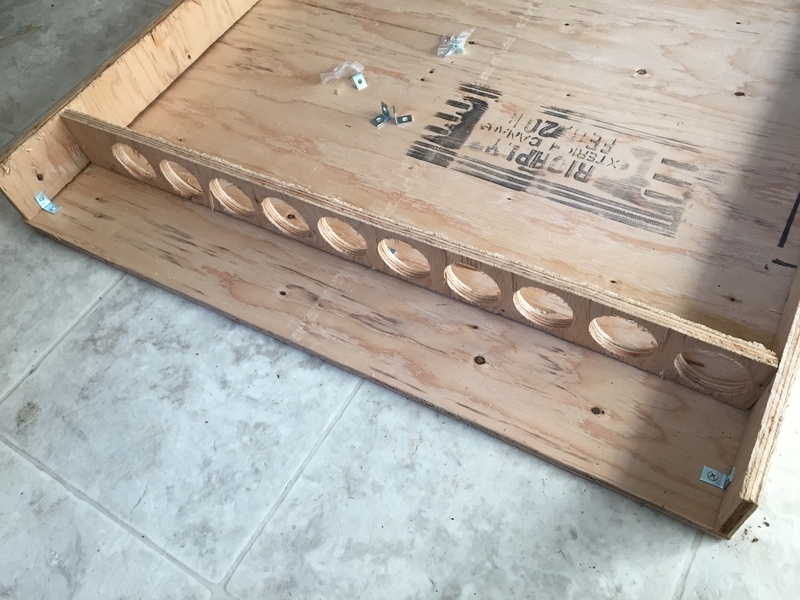 There were extra screws and brackets left over and can be used for other projects. It’s built of ½” plywood for light weight and the fact that it is mounted inside the house means it doesn’t need insulation. Self-contained units meant to be mounted outside would need to be built of thicker wood and likely insulated to keep the heat inside the unit. This is just a basic project and is not meant to be the end all and be all of alternative options. We plan to build on this idea and hope it can inspire others to think a little outside the box so we can move toward a more environmentally friendly and sustainable world. As November draws to a close and the nights fall below freezing water is becoming more of an issue. Due to the lack of power out in the coops and the colony it’s becoming necessary to replace the water jugs and bottles regularly. The animals drink their fill when the fresh water is put out and usually eat a belly full of feed while they’re at it. The fear of fire is the main reason we don’t run electricity out to the animal housing and the amount of dry straw and shavings that is used for bedding. 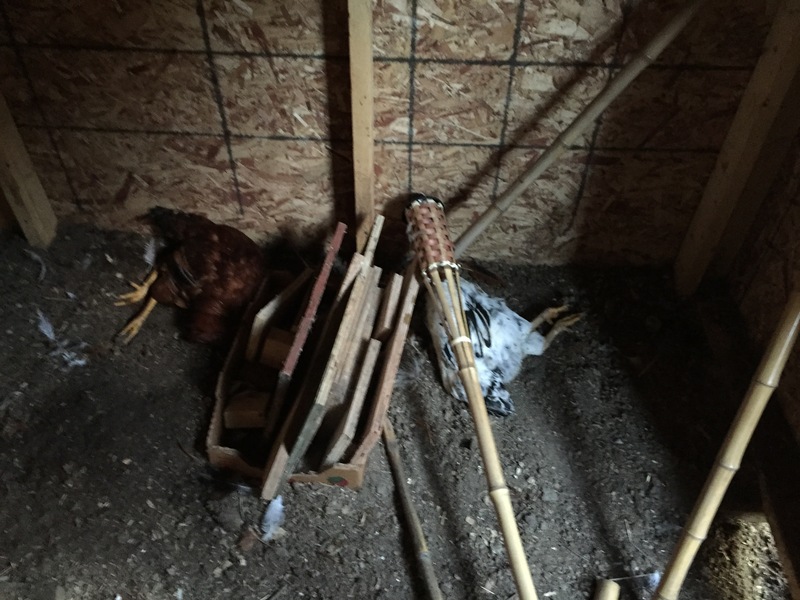 The chicken coops are directly under some giant evergreens which provide shade and protection from airborne predators in the summer but present a substantial fire hazard. 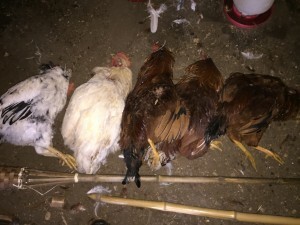 The animals have done fine under the current system with nursing does successfully raising litters in the winter and the chickens having no apparent issues. The last turkey boarded the bus to Freezer Camp on Wednesday. The turkeys have been a very successful project this year with over 360 lbs net weight of turkey being processed. Next year should prove to be less work and stress due to the infrastructure now being in place and the processing procedure under our belt. There will be a few design improvements incorporated into the system over the winter and the processing area redone in the spring. At this point it’s likely that we will raise a larger number of turkeys next year and keep a better eye on their weights so as to provide a bird in a more acceptable weight range for the table. Dawn is hatching her eggs now. She started off with ten and there were eight as of a couple days ago. One seemed to have been crushed, likely with another bonehead hen trying to lay eggs in Dawn’s nest. It was partially hatched but did not survive. At last check tonight there were seven eggs left with a couple of breaches and some tiny peeping sounds. Hopefully she will take care of these chicks with the gusto that she has raised the last two batches this year and we hope the weather holds out with the temperatures not dipping too lo for at least a couple of weeks so the chicks ill have a chance to grow some feathers and get stronger. They will likely spend most of their time under their mother so we hope it won’t be a problem. Lucille Bunnyrabbit continues to renovate her fancy nest but still no kits yet. 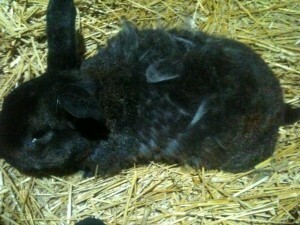 It is built pretty deep with straw and lots of fur so it seems she is expecting something but nothing yet. Fred Bunnyrabbit is still going strong at age seven, the poor guy is molting right now and looks like he has a serious case of bed head all over his body and enjoys a good hard back scratch as he is probably itchy as hell. Some renovations and redesign will be coming for the colony to update and reinforce things and make it easier to measure the food so as to keep an eye on expenses. We here at The Welcome Homestead wish everyone a happy and productive week! Well, we missed last week’s Week in Review due to web site changeover and actually there wasn’t really anything exciting that happened that week anyway. We hope something exciting happens here every week but the reality is that it doesn’t. It could be a good thing, though, as it could indicate everything is going along without a hitch, however, we prefer some happy excitement! We’ve now entered the season of frozen water and foggy glasses. Last night was the first night we have had to deal with frozen water bottles, more specifically the ball and tube assembly on the bottle freezes. The chicken water jugs aren’t as vulnerable to cold due to the larger volume of the jug and the greater number of tiny beaks that constantly drink out of them and keep the water stirred up. Of course, under a certain temperature they will freeze solid in a short amount of time so will have to be replaced three or four times a day. Dawn is still setting on her eggs, down now from ten to eight, likely due to other dummy hens still trying to lay eggs in her nest and stirring things up. 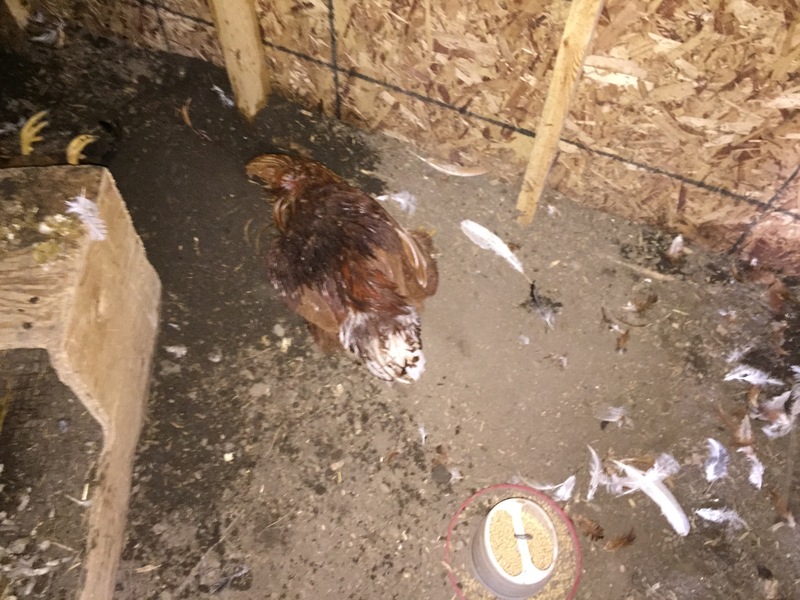 Hens have been removed from her nest after being found squeezed in with her while trying to lay their egg. There are eight other nest boxes available but the stubborn birds seem to really like a certain nest box. This completes the second week of setting for her so if we’re lucky we should start to see some chicks sometime next weekend. 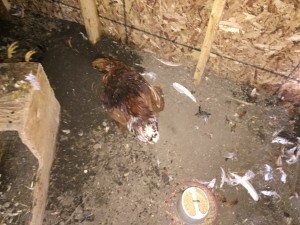 They will have to be closely monitored and if there is a problem they will have to be brought into the house and raised inside until they are fully feathered. Hopefully Dawn will take good care of them and they will be feathered by the time the dog days of winter set in. On Monday two more turkeys were processed, 25 and 28 pounds respectively, bringing the total processed weight of the turkeys this year so far to 321 pounds with one big tom left. The turkeys have been very successful this year, more than expected actually, so we hope with better weight monitoring next year they can all be processed at an optimal weight of about 16-18 pounds. That first tom that went on the scales at 44 pounds sure was a real shocker. 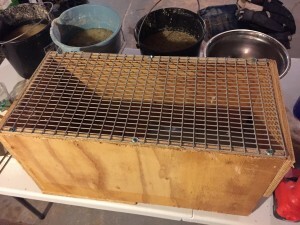 The meat grinder and vacuum packager worked overtime for a while there and we should be set up for meat until the next batch of birds is processed next year. Here’s the last man standing. He’ll likely be on the bus to Freezer Camp this week. Lucille Bunnyrabbit built a beautiful nest, deep in straw and liberally mixed with fur but no popples as of yet. It’s not certain what the problem is as she has had litters of 11 last winter and is still a young doe but we’ll keep going with her for now. It’s been very disheartening to see two nests built in the last couple of months and no kits but it is a part of nature so we just have to go with it. 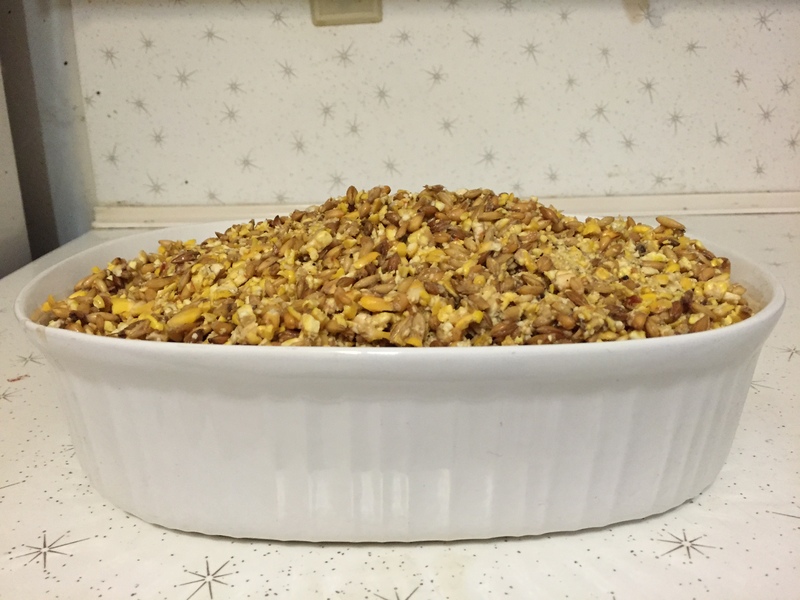 There have been many highs and lows as we continue along our Homesteading path and that contributes to the sense of satisfaction when things seem to work out in the end somehow. 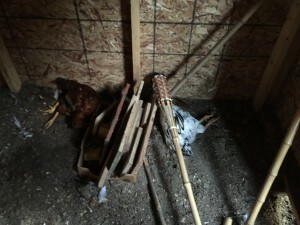 With winter now on us there will be less work outside besides the normal cleaning and maintenance of the colony and coop. The last tom should be processed this week so that will be one less facility to clean out and one less water jug and feed pail. This winter will be one of planning for the spring and deciding what the new project will be for the coming year. We’re hoping for a mild winter this year on The Homestead but there is no real way to know until we wake up each morning and look out the window. All of the critters at The Welcome Homestead wish everybody a productive and safe week. 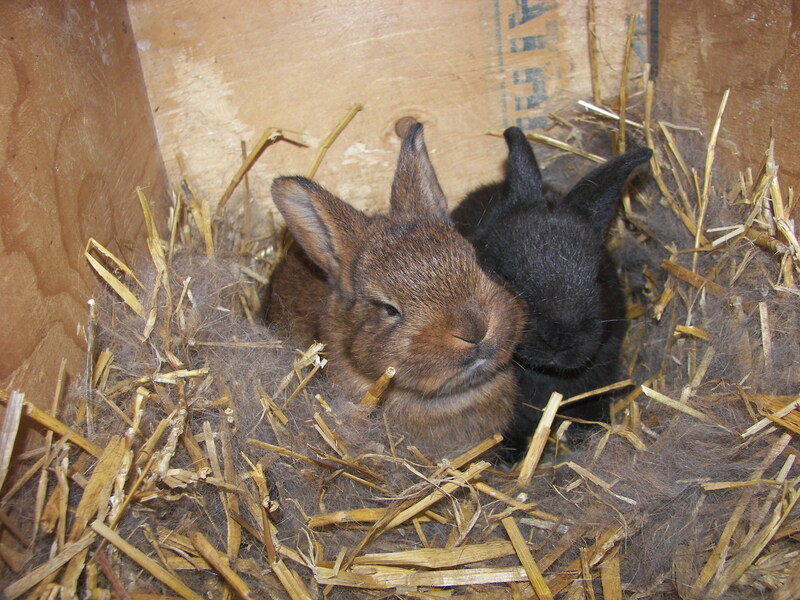 These two tiny furballs are enjoying a snuggle in a nest full of straw and Momma’s fur.